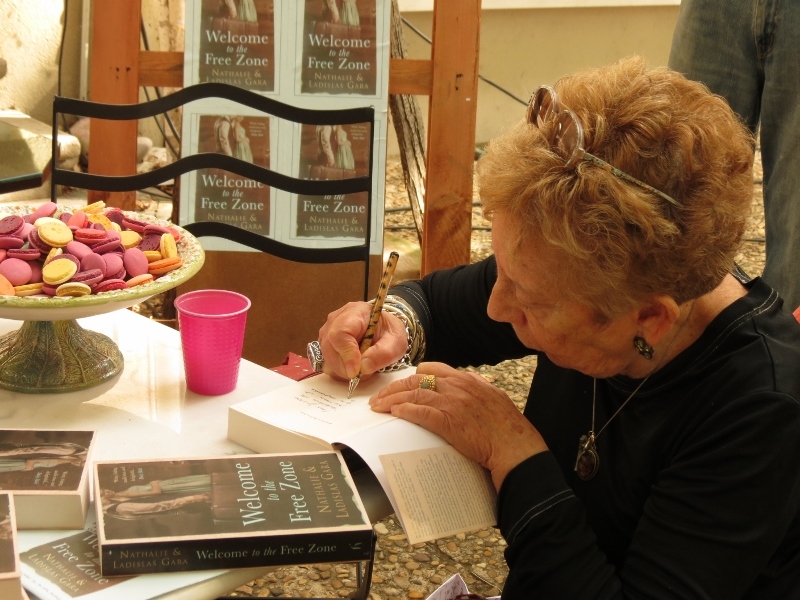 On Saturday morning we organised an event at the Arbre à Feuilles bookshop in Lamastre to celebrate the publication of Welcome to the Free Zone. Claire Meljac, the authors’ daughter valiantly signed copies all morning, and chatted with the many people who stopped by our little presentation area. Myriam’s bookshop is a focal point in Lamastre, stocking a very extensive range of titles which cover all subjects, from literature and philosophy to local history and nature titles, along with a delightful stock of children’s books and a wide selection of quirky and colourful bits and pieces which reflect her lively taste. Right at the back of the shop, once you’ve negotiated the kids sitting on the floor, utterly absorbed in a book they have picked out, you find yourself in an Aladin’s cave of brocante items, another of Myriam’s passions. This is truly the kind of vibrant, buzzy independent bookshop which it is a joy to discover. Satuday is the local farmers’ market day and on this beautiful sunny morning there was a steady stream of people passing. We had mostly expected interest from English speaking holiday makers and residents but we were very pleasantly surprised by the number of local French people who had heard about the event and came along to meet Claire and talk to us. It is a pity that the French edition of St Boniface et ses Juifs is currently out of print, but their interest was such that several French speakers actually bought a copy of Bill’s translation. Most touching for us were the number of locals who spoke of their own experiences in the area during the war years. Some people had direct memories of Ladislas and Natalie Gara during the time they were in hiding here and others shared moving memories with us, sometimes for the first time, of living through the disruption, confusion and danger of that period as half comprehending children. Welcome to the Free Zone published! 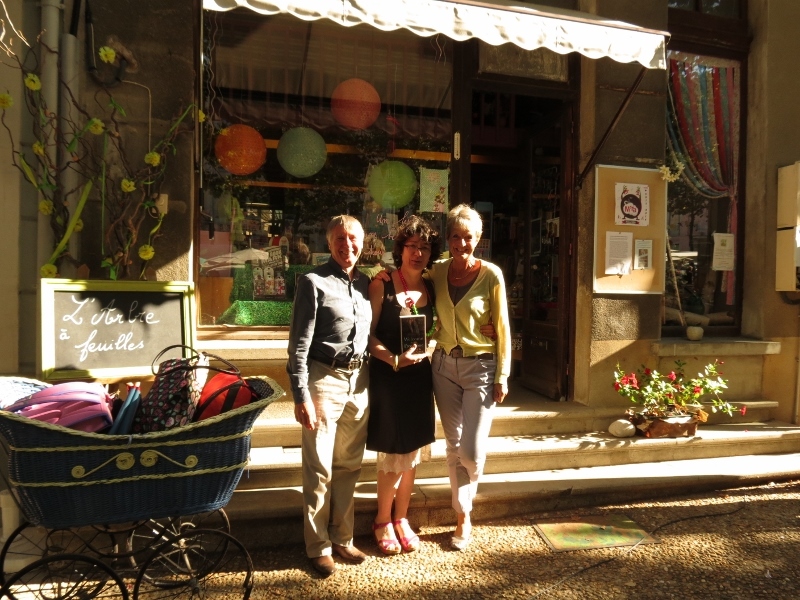 Kate and Markus raise a glass with Claire Meljac, daughter of the authors, and her husband Sasha at their summer home in the Ardèche, to celebrate the publication of Welcome to the Free Zone. It has been a privilege and a pleasure to get to know Claire over the long period of preparation and research which has culminated in our friend Bill Reed’s magnificent translation. Claire’s insights and comments on her experiences whilst in hiding, together with her parents, in the Lamastre area throughout the most dangerous phases of the German Occupation of France have been fascinating, moving and inspiring. Looking out over the beautiful Ardéchois landscape from the terrace in front of her home, you can see the village of St Basile, a location which features prominently in the book.